Eat, Run, Read: Bacon + Chocolate = Yum? Go ahead, be appalled. That is what you think it is - a dark chocolate bacon bar - and I'm eating it. And crazier still, I'm enjoying it! Not that I'm a bacon hater, but there is just way too much hype online in the bacon department. 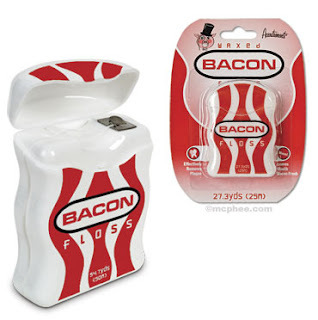 (OMG - listen to the Bacon Song.) 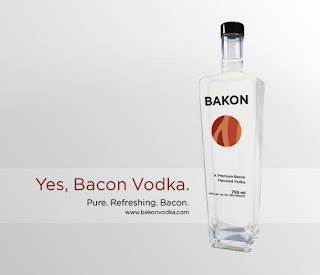 Sure it's good, but I really don't think that bacon is up to God's-Gift-to-Humanity status. Everything is better with bacon? Hardly. Would my Ginger Plum Upside Down Cake be improved by bacon? I seriously doubt it. That being said, I was a little hesitant when Boss #2 presented me with a Dark Bacon Bar. Hmm...I tentatively broke off a corner...put it in my mouth...and "let the lust of salt and sweet coat [my] tongue" (woah there chocolate bar wrapper - trying to get friendly with me, are you?). But I'm not going to lie, it was pretty freaking delicious! The bar is dark chocolate, with tiny bits of crisp salty bacon imbedded in it. It was definitely rich and decadent tasting - I imagine it was tricky to get the chocolate-bacon ratio correct - too much bacon would be BAD. But this bar gets it right. Just a hint of bacon makes the chocolate more complex, adding a layer of flavor and richness. So here I am, recommending a bacon chocolate bar. 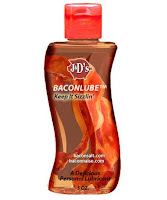 Seriously, even if you're not big into bacon, try this! 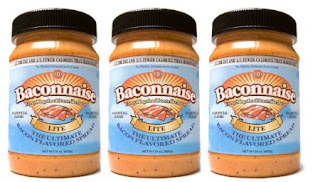 Here's another blogger's list of the 11 Worst Bacon Products. Some I agree with (like Bacon Lube - omg I can't even handle the thought of that one! 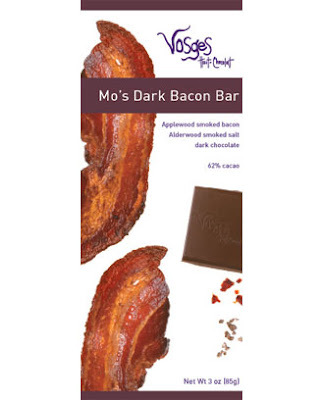 ), but my delicious Bacon Chocolate is also on this list...I want to know if the blogger tried it! 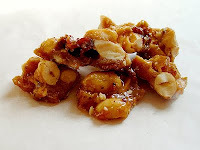 To end on a happy note, I bet that Depraved Chili Rubbed Bacon Peanut Brittle is really yummy!